A Traditional Life Lived: Girl Scouts sites Media Matters for America as media watchdog. Girl Scouts sites Media Matters for America as media watchdog. 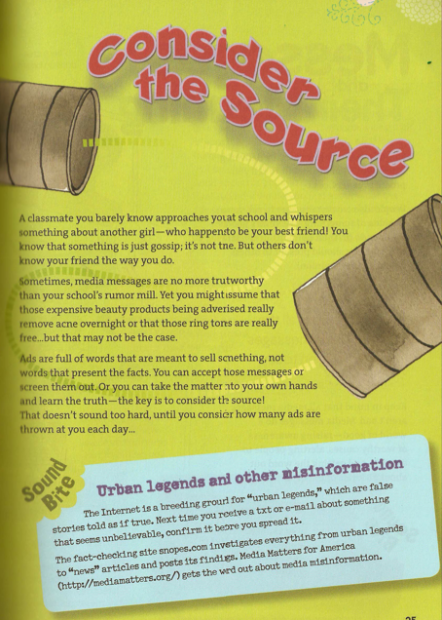 The Girl Scouts of America recently published a book pointing out that you girls should be skeptical of the information given to you by the various media outlets. If you hear something, you should check it out.....verify it is truthful and real. Go to Snopes, do your research......use sites like Media Matters for America to clear up any misinformation. Yes parents, you read that right, the Girl Scouts is telling your daughters, age 8 to 18 that before they believe what they see or read or hear they should do their "fact checking" with the left leaning, Soros funded, Media Matters for America. The Girl Scouts claim they are reprinting the book and taking out the MMfA reference, however recent shopping trips to purchase this book in Western Ohio, Cincinnati, Ohio, Jacksonville, Florida, Houston, Texas, and St. Louis, Missouri have netted no such change. I plan to demand they change that passage to direct readers to Foxnews.com......think that will go over pretty well? uh, no? Not a snowball's chance in hell!